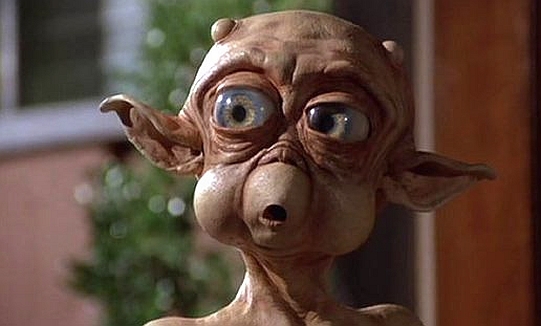 The effects team on “Mac And Me” included Joseph Yanuzzi (“Ghost Dad,” “Saturday the 14th”), Steven James (“Leviathan,” “The Monster Squad”), William Forsche (“Dead Heat,” “Dolls,” “From Beyond”), and Martin Becker (“Suburban Commando”). 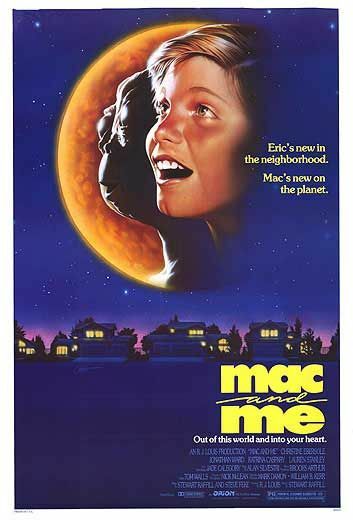 The story of “Mac And Me” follows a family of alien lifeforms who become stranded on Earth, and have to find a way to escape from evil scientists from NASA who want to experiment on them. As you might expect, they befriend a kind-hearted band of children along the way and become involved in an assortment of shenanigans. “Mac And Me” has regained a degree of cult notoriety thanks to the Hollywood actor Paul Rudd, who has repeatedly played a specific clip from the movie whenever he has appeared on Conan O’Brien’s late night talk shows. The infamous dance scene in “Mac And Me” was filmed in a McDonald’s constructed specifically for filming purposes, and has been used for commercials, films, and training videos. “Mac And Me” was made with a profit sharing agreement with Ronald McDonald Children’s Charities. Unfortunately, the film was a financial disappointment, failing to make a profit on its estimated $13 million budget, grossing just under $6.5 million in its total theatrical run. Apparently, both Kim Basinger and Anjelica Huston declined offers to play the lead role in “Mac And Me,” with Basinger choosing to instead star in “My Stepmother Is An Alien,” another awful alien-themed comedy movie. The reception for “Mac And Me” was astoundingly poor, and the film currently hold an astounding 0% critics score on Rotten Tomatoes. The audience score is a still-awful 38%, which lands along the same lines as the IMDb rating of 3.4. 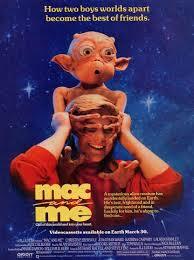 It should come as no surprise, but the acting in “Mac And Me” is astoundingly terrible. This is partly due to the fact that so much of the acting load is put on to children, who are prone to be awful actors to begin with. However, the kids in “Mac And Me” struck me as awful even by child acting standards, and are honest difficult to watch and listen to. The alien designs and effects in “Mac And Me” are frankly awful. “E.T.” wasn’t an attractive alien by any means, but he looks like a work of art next to the rubbery, bizarre appearance of the “Mac And Me” walking nightmare creatures. For a movie like this, the creatures should be a focal point with an immense amount of effort and care dedicated to them. Instead, it looks like the aliens were afterthoughts in “Mac And Me”, and even look worse than b-movie stop motion aliens from films like “Laserblast,” which was released a whole ten years before “Mac And Me” (on what was certainly a lower budget). “Mac And Me” is, of course, a truly shameless ripoff of “E.T.,” and wasn’t even particularly well timed for a typical ‘mockbuster’ aiming to profit on the coat tails of a big budget success. I just can’t fathom how it took 6 years to get an “E.T.” imitation out into theaters, and why anyone thought it would be a recipe for success after so many years had passed? For comparison, most of today’s ‘mockbusters’ come out around the same time as the DVD release for their target movie, in the hopes that people will confuse it with the hit (such as “Transmorphers” and “Transformers”). At most, the gap between the blockbuster and the mockbuster is a year. Overall, “Mac And Me” is a visually painful and intellectually dull experience, but it certainly holds a place in film history. The product placement and alien suits almost need to be seen to be believed, and I would consider it a justified “good-bad” classic for the sheer amount of wrong-headedness required on the part of the production and creative teams for “Mac And Me” to ever happen. For fans of bad movies, “Mac And Me” is worth checking out, but the experience isn’t necessarily going to be fun or enjoyable. It is more like required reading.